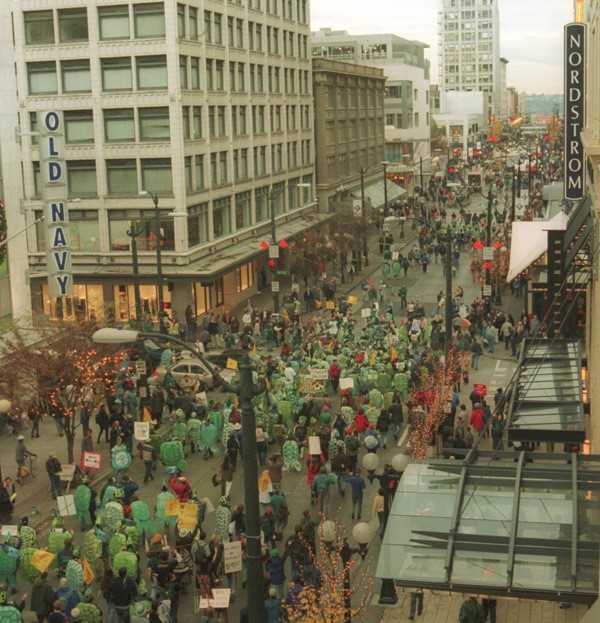 Seattle Municipal Archives, Protest March on Pine Street, November 29, 1999, 990909-200000330. This year marks the 20th anniversary of the World Trade Organization (WTO) protests in Seattle. Between November 29 and December 3, 1999, anti-globalization demonstrators took to the streets in opposition to the WTO’s coercive trade practices. From anarchists to labor unions members, and environmentalists to human rights activists, the anti-globalization movement that converged in Seattle on the eve of the millennium was indeed diverse. In what came to be known as the Battle in Seattle, police cracked down on protestors with pepper spray, tear gas, rubber and plastic bullets, concussion grenades, curfews, and mass arrests. What began as a protest against global free trade concluded as an anti-police brutality protest. Seattle may not have not been the first convergence of activists united in opposition to corporate globalization—similar protests had taken place in the years and months leading up to the WTO in Paris, Madrid, and London, and similar events followed in Washington, D.C., Quebec City, and elsewhere—but it did become the most iconic. Paul Adler, Assistant Professor of History at Colorado College and author of the forthcoming book No Globalization Without Representation: U.S. NGOs and the World Economy (The University of Pennsylvania Press), reflects upon the significance of the events in Seattle. Jacqueline Brandon: Let’s begin with some basic context: at least 40,000 people took part in the Seattle demonstrations. Who took part, and why did they target the World Trade Organization? So, with that caveat, let me start by saying why such a diversity of groups all coalesced around the WTO. The World Trade Organization grew out of about 50 years of dialogues about creating some kind of body to arbitrate various international economic relationships. The WTO began to really take form during the Uruguay Round talks that started in 1986. The Uruguay Round talks arose out of a need seen by many policymakers to expand the mandate of the GATT [the General Agreement on Tariffs and Trade]. This happened in the midst of neoliberalism’s rise, the demise of “Third World” attempts to forge a New International Economic Order, and the debt crisis. For many in the Global North, there was a desire to facilitate greater trade and multinational investment. For many Global South policymakers, the idea of regularizing the rules and dispute mechanisms among poor and rich appealed, as did expanded economic liberalization. The WTO first opened its doors, so to speak, in 1995. Right away, there were a few decisions made by the WTO that really raised concerns among environmental, consumer, pro-Global South, and labor activists. For instance, the WTO ruled against an EU policy from the mid-1970s that gave preference to exports from former colonies – a policy that had created some economic stability for countries like Jamaica. There were also questions around topics like intellectual property rights, drug prices, and clean air rules. Now, the WTO could not force a country to change its laws, but it could facilitate trade retaliation against a country that refused to comply with the rulings of various arms of the WTO. These rulings sparked fears that the WTO was going to become this pro-corporate, supranational entity overriding sovereignty in the interests of business profits and hyper-capitalist economic development models. Now, there already existed an international set of activists – mainly situated at NGOs and some social movements – who had been working on issues of Third World debt, consumer safety, environmental protection for many years prior to the WTO coming online. In my book, I argue these actors began really coalescing into a coherent network by the 1980s. They saw the WTO as a new expression of the threats they had been already dealing with. What “worked” as far as activist organizing about the WTO was that this single entity’s mandate included all sorts of issues; in other words, the WTO presented a singular target that many constituencies could all focus on. JB: The demonstrations were defined by direct action tactics and grassroots organization. The juxtaposition between a supranational body with somewhat arcane regulations on the one hand and a ragtag group of protesters occupying the streets on the other is somewhat striking. Other than blocking the WTO’s proceedings from taking place, what were some of the alternative visions for global capitalism that these activists put forward? In other words, what ideological commitments supported their anti-globalization? PA: So, here again, there are many different answers. The most moderate end of the demands were from groups like the AFL-CIO (the main body, not necessarily all the individual unions) or some environmental groups like the Sierra Club. Next, you have the more militant public interest groups, like Global Trade Watch or Friends of the Earth. These groups did not quite want to abolish the WTO, but they wanted to “prune” or “shrink it.” They simply wanted a number of issues to been taken out of the WTO’s purview, such as anything affecting medicines or other health regulations. That viewpoint also included a number of the Global South-based NGOs. Those groups had better articulated visions of what the world economy would look like, including empowering certain United Nations agencies more dominated by Global South interests (like the UN Conference on Trade and Development), cancelling Global South nations’ debts, and taxes on international financial transactions. I think of these groups as, in essence, searching for a social democratic vision of world economic governance. Finally, on to the abolitionists. You had a mixture of radicals, including both the Ruckus Society/Direct Action Network and the “black bloc” who were expressly anti-capitalist. These groups really emphasized local, sustainable economic forms and trans-national solidarity, rather than a highly detailed vision of a different world economy. JB: I am curious about chronology. You mentioned that trade liberalization had been years in the making, so why did things only come to a head in 1999? In looking back on 1999, both sympathizers and critics of the anti-globalization movement discuss Seattle as a moment of rupture. The economist Joseph Stiglitz, for instance, wrote that Seattle marked “the discrediting of globalization and the view of triumphant American capitalism that underlay it,” making it “difficult to remember the heights to which optimism about globalization had soared.” (Roaring Nineties, 205) The 1990s were, of course, defined by economic prosperity and growth, seen by many as “the end of history.” What do you think precipitated this moment in particular? PA: What I would argue in the book is that this is where Seattle cannot be understood outside of a bigger political historical narrative. In my book I go back to the 1970s, but for now, I think the best starting point is NAFTA. The debate over NAFTA [the North American Free Trade Agreement] was a years-long one—really from at least the summer of 1991 through the end of 1993. The debate over NAFTA received major media attention, heck even Saturday Night Live did multiple sketches about it. Coming so soon after the end of the Cold War, the debate over NAFTA (in the USA, Canada, and Mexico) became this focal point for many different people and constituencies to express a multitude of anxieties about late twentieth century globalization. The fight over NAFTA, in the USA, created a network of liberal groups—most of the same ones that would play roles in Seattle—which began coordinating their efforts on issues of trade and globalization. Now, of course NAFTA passed, but that eventuality only became clear in the few weeks right before the vote—for most of the debate, it looked likely that NAFTA would lose in the US House of Representatives. It passed by 34 votes in the House, which is substantial but still hard fought. Plus, soon after was the Mexican financial crisis and more stories in the US of factory closures made NAFTA increasingly unpopular among large segments of the U.S. public. The next big piece of context for explaining “why Seattle?” are two fights in 1997-1998: Fast Track and the Multilateral Agreement on Investments. Fast Track is US legislation which is supposed to streamline the passage of trade agreements; it also has to be renewed every few years. Clinton moved for approval but through some complicated politics involving GOP opposition to him and the work of “fair traders” (like the Sierra Club, Public Citizen, etc.) to hold Congressional Democrats to account for voting for NAFTA, it failed twice (the first, Gingrich stopped the vote from happening because its passage looked unlikely, the second time it was defeated). The Multilateral Agreement on Investments was a proposal being negotiated through the Organization for Economic Cooperation and Development (OECD) to create a new global set of rules for multinational corporate investment. Originally, there were hopes from its creators that it could be incorporated into the WTO, but that proved too controversial, so they tried through the OECD first. So, you have many national governments feeling that the trade and globalization agenda is faltering. To resuscitate it, they want to have a big new round of WTO agreements. One part of that thinking was public relations. They choose Seattle, rightfully, because it was and is the home to all these big, successful multinationals, like Microsoft and Starbucks. Of course, that proved a big mistake for them. After all, Seattle is also a pretty activist-friendly city, with a strong and assertive labor movement, a really large environmental community, and the Pacific Northwest is where a lot of anarchist groups have made a home. So, Seattle became an ideal venue to mount effective and large protests. And what I think those protests did was reaffirm that inequality represented a continuing concern for millions of people around the world. Also, and this is somewhat of an autobiographical note, but I think from *many* conversations, that young left-leaning people looking for a cause were inspired by Seattle to jump into activism. JB: Interesting! Speaking of Starbucks… In the media coverage of events, much was said about the “black bloc” anarchists willing to carry out property damage (smashing windows of corporate giants like Starbucks and Nike). The activist and writer Rebecca Solnit wrote of Seattle that, “The myth of activist violence is a way of concealing and dismissing real power. And maybe it’s also a measure of that power, if a frustrating, damaging one.”  What do you make of the media portrayals of the events? Did the radical fringe of the movement occupy disproportionate attention, collapsing what was indeed a diverse movement into one seen as threatening, sinister? PA: I think it’s a fact that, relative to their numbers, the “black bloc” received disproportionate news coverage. Although, there was certainly coverage of non-“black bloc” groups, particularly of the labor march. I do think, however, that the diversity of the movement was lost in mainstream media accounts, as people opposed to various aspects of globalization or global capitalism always had to answer the questions about property destruction. At the same time, I do wonder if absent the property destruction the protests would have received near as much media attention. And here, very ironically, law enforcement’s use of physical force actually balanced the situation to some extent. In Seattle at least, I think a lot of bystanders who were initially frustrated by the protests grew even more angry about the police teargassing and clubbing people. JB: Last question: as historians we are of course cautioned against reading the past through the lens of the present, but do you see Seattle as having foreshadowed the anti-globalist populist upsurge of recent years? Does understanding what took place in Seattle shed light on the present situation? PA: It’s a complicated question. If there’s an international event that I think Seattle helped presage it was actually the “Pink Tide” in the 2000s, the rise of left-leaning governments in Central/South America that were looking for ways to challenge the IMF/World Bank or global capitalism. The energies from Seattle I think were very different than the right-leaning movements of people like Orban, Bolsonaro, Trump, etc. In fact, there’s a great anecdote about Pat Buchanan, who was sort of Trump before Trump, going to Seattle to participate in the protests. He thought there might be a lot of allies among the demonstrators. He ended up basically staying in his hotel room and reflecting that the protestors were very much not his people. However, the other place I do see resonances is in some of the politics of the Democratic Party now. If you read Elizabeth Warren’s recent article on foreign relations or Bernie Sanders’ recent speeches, there’s a lot of discussion over how neoliberal economics has exacerbated inequality and undermined democracy. Sounds quite similar to what some activists at Seattle were saying. But for the right-leaning, anti-NAFTA/free trade politics that you see Trump articulating, the fight over NAFTA is much richer ground. Opposition to NAFTA crossed ideological boundaries, whereas Seattle was more of a party of most everyone on the labor-liberal to radical left. JB: Ok well this was all so interesting – thank you!